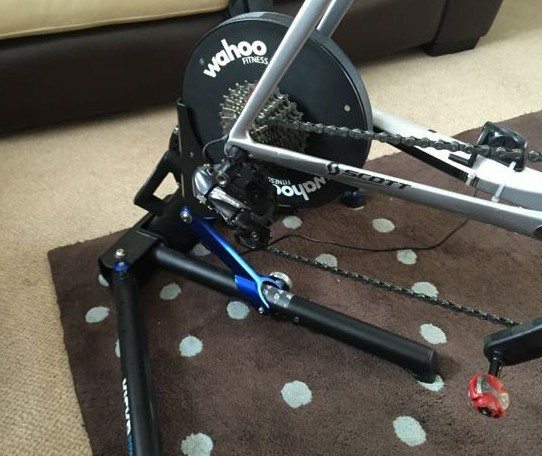 Wahoo KICKR review – One Turbo to rule them all? 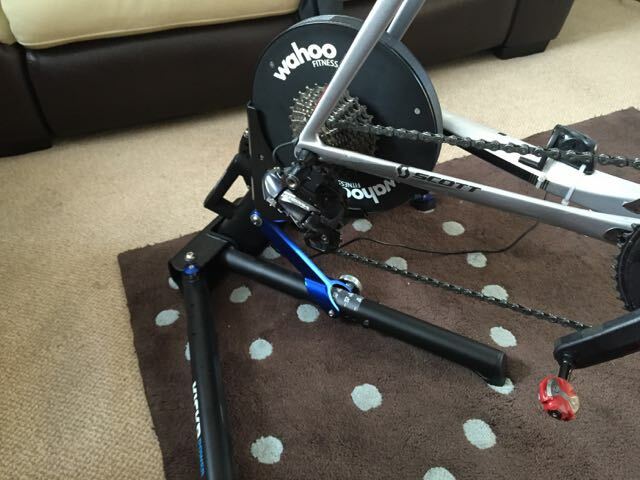 But if Carlsberg did try to make a turbo trainer… I don’t think they could make one better than the Wahoo KICKR! OK first things first, before we get into the Wahoo KICKR review properly, there are two major things to note about the Wahoo KICKR. NB THESE ARE NOT SPONSORED LINKS, I just like to indicate my workings! And still have at least £150 left to burn, and let’s be fair, if you can’t find a discount code for either of these sites, you are doing something wrong! So the question here is, what do you get for that £149?? When the major things that hits you when you try and pick up the box, let alone get your hands on the turbo inside is that the KICKR IS colossal, now I don’t mean it takes up space, I mean it weighs 21kg! TWENTY ONE KILOGRAMS. This is not a turbo trainer you can describe as easily portable. With the TacX Turbo, if its in the wrong place even with the bike attached, its easy to move it a foot or two to reposition. 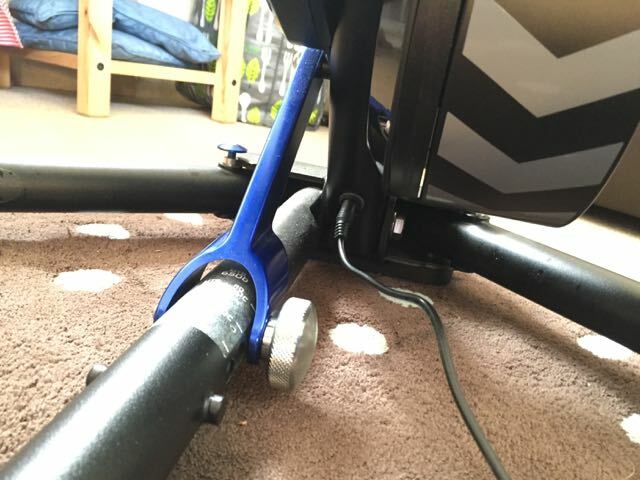 Once the bike is attached to the Wahoo KICKR, yes you can move it, but I’m always very careful, as I feel there is a real possibility if you tried to move the bike, rather than the turbo, you’d just snap off the chain and seat stays. The Wahoo KICKR is beautifully constructed. I honestly don’t think I own many things that feel this robust, and durable. Possibly my Leatherman Wave. Maybe one of my pet rocks. This is a machine designed and engineered to last. The handle is reassuringly inflexible when you try to pick up the Wahoo KICKR’s 21kg weight. All of the struts, are thick, sturdy and move into their locks with a reassuring “Thunk”. Look at the welds on the arms! This is NOT a toy! But this is also a slight downside to this turbo. With the TurboX, you can fold it up, and if you wanted to slot it into an overhead cupboard. Honestly, I wouldn’t want to put this anywhere on the floor. No, only if it fell could it very possibly kill someone but it would damage the floor. The fall, however, wouldn’t damage the Wahoo KICKR, of that I’m certain – one description of this thing might be tank like. The fact that the Wahoo KICKR comes with its own cassette is great, as it means you are set up and ready to go…as long as you are using a 10-speed setup. As I’m on Ultrega Di2 6800, I’m on an 11-speed setup, I had to change the cassette, which after you’ve already paid so much for the trainer is a mild irritation. However, it does mean that you can use the same cassette as is on your wheel. Using the gears on the KICKR during a simulation is exactly the same as using your bike on the road. When going up a simulated hill if you are using software like Zwift, you change gears as you would do normally, as the KICKR increases resistance to mimic the hills. Simples! An interesting point – given that the new 11 speed Campagnolo and Shimano system as SO similar, you can use a cassette interchangeably. What I mean is that my winter training wheels have a Campagnolo Corus cassette on them. whilst my summer wheels have Shimano, and I can change between the wheels as I need, and the Di2 derailleur doesn’t seem phased at all. The same also goes with the KICKR. 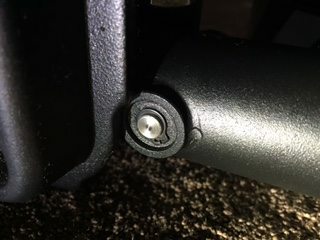 I have a matching Ultegra cassette on the Wahoo KICKR and can plug directly onto it from using my Corus training wheel with no needs to adjust anything. Note this only works with 11speed. In which case, if I were going to use 11 speed anyway, I’d just leave a Shimano cassette on it, even if I had a Campag cassette on my wheels – but that’s just my opinion, your own mileage may vary depending on differences in teeth etc. For a turbo, the Wahoo KICKR is pleasing quiet. Often I’ve found turbo trainers to be…antisocial devices. My girlfriend can sit in the same room doing stuff on the computer without any great issues. Now I’m not saying that it’s silent, neither am I for that matter panting away, but it is very tolerable. One slight any social factor about the Wahoo KICKR is its need for POWER. By that, I mean electricity leads running around the house. Regrettably, the power lead is absolute, you can do nothing without it. I suppose you could use it as a very dull, unadjustable static trainer without, but the resistance can’t be changed, and with the power off, its rather stiff. 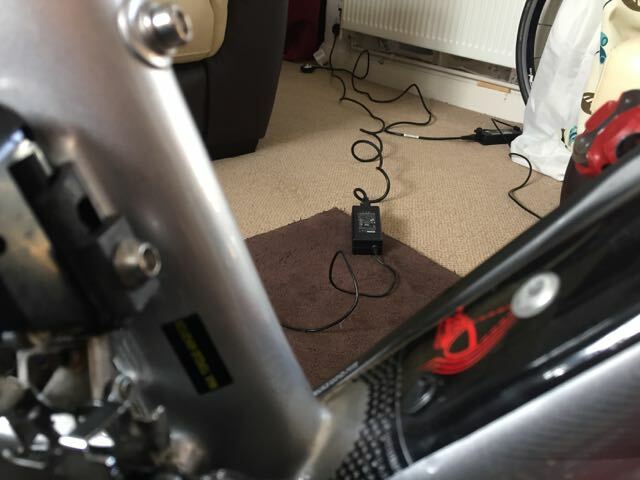 In my opinion, the power cable socket is also in a rather daft place, located underneath the trainer, requiring some odd positions to locate the plug hole when first setting up the trainer. I’m sure, looking at the thing there is a perfectly reasonable engineering explanation WHY it couldn’t be located somewhere more ergonomic, or sensible, but in the grand scheme, a minor gripe. Once you are finally plugged in and ready to go, you then need to setup the Wahoo KICKR both on your head unit – its broadcasts through ANT+ and Bluetooth 4, so you are good to go on most systems. There is a Wahoo Utility phone app used to pair the trainer to your phone or tablet, and then Wahoo has their own Fitness app. 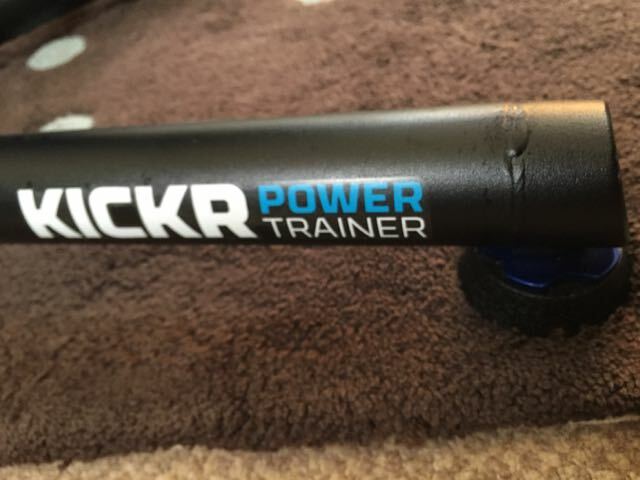 I must confess I dispensed with that rather quickly, I didn’t get a Wahoo KICKR to use it as a simple turbo trainer. When I rowed at university, the WORST part of the entire experience was the rowing machine. Not the gym, and the circuits, getting hypothermia out on the water. But the static rowing machine in the corner of the gym that claimed hours of my life, and gallons of my sweat. 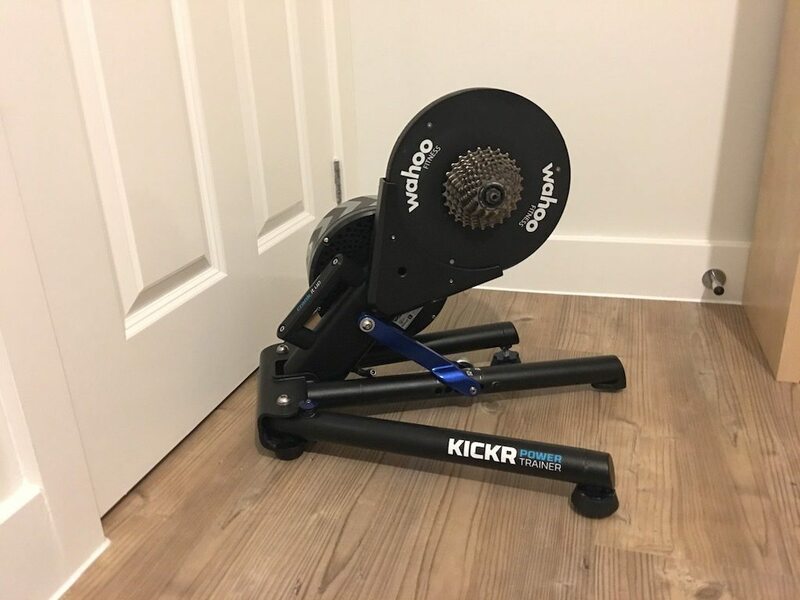 The Wahoo KICKR has an excellent function that it can vary resistance according to signals coming in from other devices, and several companies, TrainerRoad, Kinomap and a few others have actively capitalized on this. The idea here is that training is more than looking at numbers on a screen and praying for the end, be that your own dead, or the end of the training session. TrainerRoad provides both the web page and an app where you can stream the training to your TV, and it dynamically adjusts the resistance of the Wahoo KICKR. On TrainerRoad, I initially ran their Functional Threshold Power session. This uses the various KICKR resistance modes. In the FTP session, the software completely controls the resistance part of the time in ergo mode, so if you change gears, or your cadence, the resistance will change in response to keep you in a power band, when this part of the session has finished, it will transition to resistance mode, here the Wahoo KICKR sets a resistance level, and you hack away at if for whatever the time is, if you change you gears, as you would when out on the road, and it need be, you can also change the resistance, if you iPhone/iPad or laptop are within arms reach. 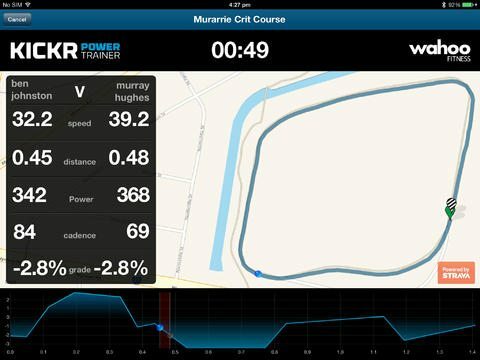 All the while with TrainerRoad, you’ve graphs on the tv showing where you are in the session, and comments about what is going to happen next, and different bits of advice. The KICKR also transmits information on your speed, and power over Bluetooth to a laptop, so they will also display on the TV. If you have a Bluetooth HRM and cadence, you’ll get that too, if not you have to rely on your head computer for those. I’m not sure when you need “Level”, but “Sim” is what I really use the Turbo for. Using the Wahoo Segments app, you can ride Segments from Strava, and the Wahoo KICKR adapts resistance in real time to the hills etc that are recorded on the GPS Strava data. 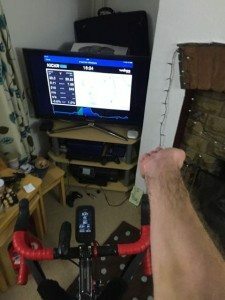 Like the KICKR itself, its not cheap at £22, but then TrainerRoad is a £6 per month subscription. The Segments app really changes things up, as you can ride routes you KNOW, routes you have been on before, and personally, I find that REALLY powerful, as you know where the hills etc are, and the resistance changes accordingly. From a mental side of things, during the winter, personally, I find this much more effective than just doing 45min or 60min sessions. Yes, you probably get more effective scientific training from TrainerRoad. But this is the great thing about the KICKR it gives you choice. I have had a play with Kinomap and a few video based bits of software, where you cycle with a video and speeds up and decreases as you cycle “with” the rider in the video and the KICKR adjusts to the GPS data from that video. I’m not sure what the issue was, maybe my internet connection for the streaming video, maybe too much lag between the KICKR communicating my speed to the laptop, adjusting the video speed, and then relaying this back to the Wahoo KICKR, but I found it very clunky and gave up. I’d like to revisit the idea of video training in the future, but at the moment, I don’t think its quite there YET. So far I haven’t talked about the power meter part of the Wahoo KICKR yet. Well, there is little to say, calibration is advised weekly, or after having traveled/moved it a lot, and that is simply done from within the app as a 60sec spin down. As the Wahoo KICKR is a direct-drive trainer, you could argue this provides gives a more “real world” indicator of your power output, i.e. with all the losses you would expect through your drivetrain, as opposed to something like Stages that measure power at its origin, and thus can’t account for loss of power from component frictions etc. For that reason, I personally prefer the power information given to me by the Wahoo KICKR, as it is relevant to the machine I will be using for races in the future. 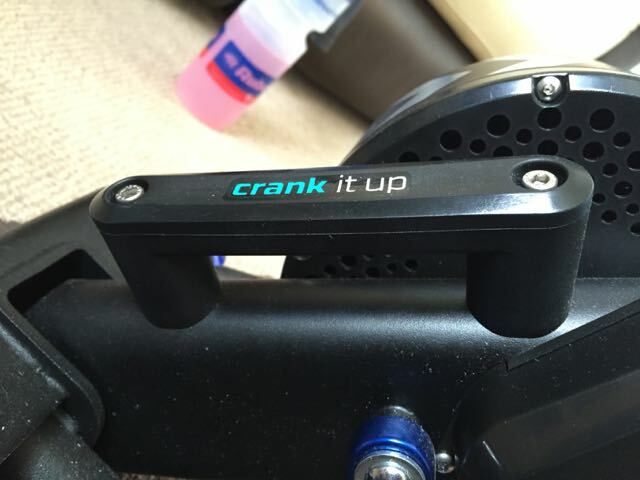 As the KICKR is located after chain, and following the turning of the cassette, there is energy being lost at each transition point from your foot, all the way through to the floor. For this reason, the power reaching the KICKR will have been reduced, by losses of heat, noise, friction and transfer efficiency along the drive train. Hence a Stage and a KICKR should never read the same overall. Overall the KICKR is expensive, its heavy, its solidly built, and has amazing potential for assisting training. 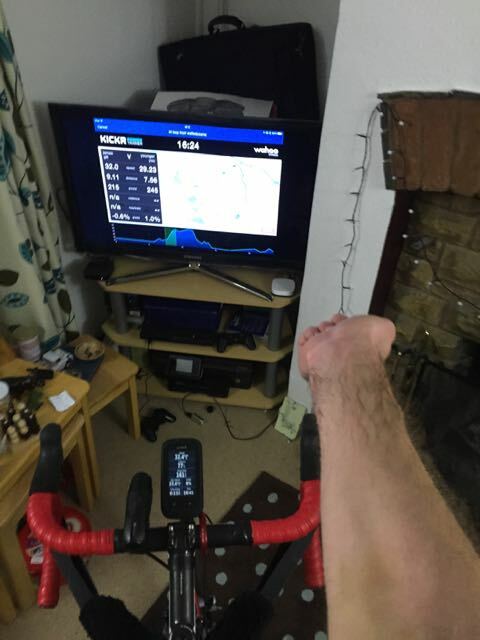 Personally, I’m finding real benefit from it with my current injury as I can still use the Wahoo KICKR, without putting my arms on the bars, and do my arm physio whilst riding! It’s just that rigidly planted on the ground, and its weight will help with that tremendously. Overall, yes I can’t use the power meter when out of the house, but I honestly believe that the Wahoo KICKR is built to last many many years, and crucially as said above, its planted stance and steadiness are really paying dividends now. Is it good value? That’s hard to say, some people spend thousands of pounds upgrading bits of their bikes and changing things from season to season. 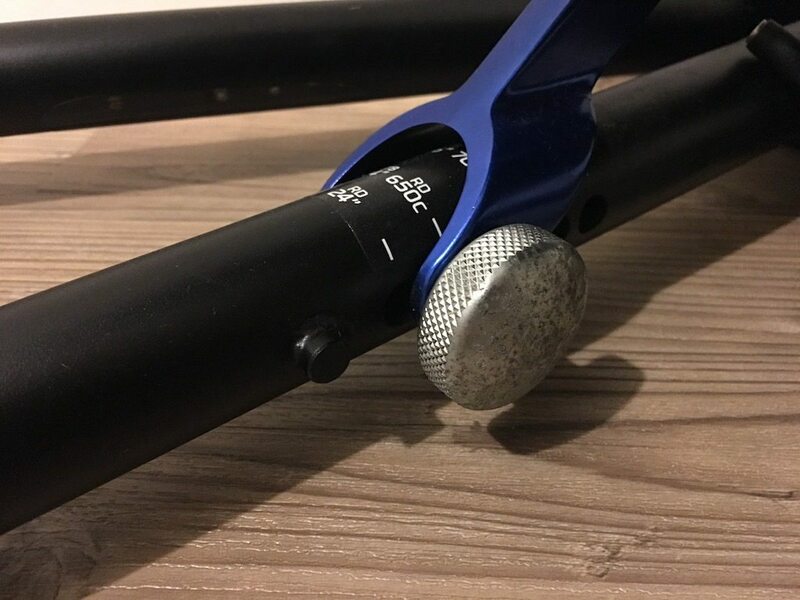 The Wahoo KICKR is expensive, but I think it will outlast many bike changes, and if something does go wrong, Wahoo’s customer service has great track record reading around the net. The Wahoo KICKR originally appeared to suggest the capability to give a virtual cadence data output, however Wahoo has specifically commented that this is not an option. I’ve very surprised at this as the new Zwift software is able to produce a relatively reliable estimated cadence when the Wahoo KICKR is used, suggesting this is as much a software issue as anything else. Maybe Wahoo cannot do the emulation within the trainer, but that shouldn’t stop other software, Wahoo’s own for that matter, being able to produce a similar estimation. The KICKR can now be driven from a third party meter, like the Stages, allowing the matching of power, when doing something like Zwift or TrainerRoad, improving the feedback loop of the simulation/ergo modes on the KICKR . The inclusion of a thermometer in the Stages should also overcome any zeroing problems too. Better spin down calculation – again more accuracy, and if there is one thing we like with our power meters, its accuracy! Unfortunately one of the small washers that holds in the spring locks on the sides of the KICKR legs broke last week. I’m not really sure how, but its a small bit of metal. The point here is the Wahoo were brilliant. A quick email to confirm my address, and I had new washers sent from the USA arriving within about 5 days. They also sent spares in case it happened again. All in all great customer service – plus I still say its built like a tank, even tanks have bits that occasionally need replacing!